If you go to Tuscany, you think of hill towns, medieval villages, Florence, Siena, maybe Lucca. All great places to visit. 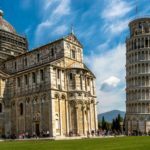 But what is not far away from this part of Italy is the town of Pisa. And you all know what is in Pisa right? THE LEANING TOWER OF PISA, of course. 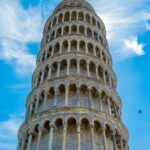 If you are in the area and want to visit “The Tower” it’s not a long drive from Tuscany. Enjoy the scenery while you travel to get there, take the back roads not the highway. It is so much more enjoyable. There are parking lots all around this attraction. Some charge more than others. It seems the closer you are to “The Tower” the more you pay. 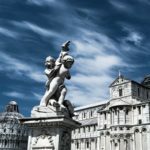 On my last trip to Italy I tried using something called Parkopedia. You type in the town, it shows you the parking lots, and how much they cost. It even showed free ones. I went in, typed in Pisa, found a FREE spot that it said was 12 min walking distance, nothing right? Well when my GPS got me there, it was MILES away from this great attraction. So we went old school, and drove till we found signs and or could see the tower. We got a spot less than 5 min walking time for only 2 Euro per hour. And you won’t spend a lot of time at The Tower so it won’t really cost you that much, cost us maybe 6 Euro. 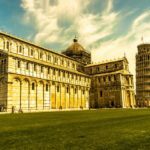 So now you are in Pisa, and you can’t wait to see The Tower, right? Well be prepared to go thru the gauntlet of restaurant hawkers, souvenir sellers, and a never ending group of people that want to separate you from your money. There are brick and mortar stores also, not just the street vendors, and they tend to sell a better product, but a bit more expensive. As you walk along the street, I suggest just don’t make eye contact, don’t interact, unless you want to of course. Now and then it’s fun just to see what they are selling and how much they will come down in the price as you keep saying NO GRAZIE. I had to laugh at this one character. You have seen them, in some custom or another or a character that is recognizable. Like in New York City in Times Square with the Super Heroes? We ran into a representative of I believe Subway Sandwiches (yeah even in Italy you will find them) and this guy was of all things A HERO SANDWICH. Around here we call them Submarine Sandwiches, so after we saw this guy, we talked about the “Italian Sub” we saw at the Piazza dei Miracoli. 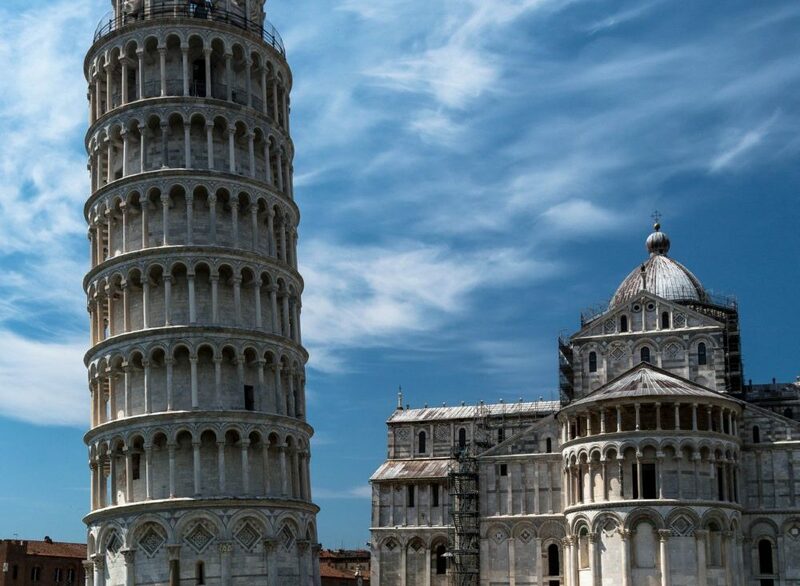 Now is the moment you have been waiting for, THE LEANING TOWER OF PISA. 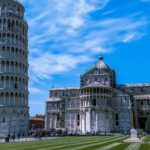 Depending on which entrance you use for The Piazza dei Miracoli, (the Piazza of Miracles), formally called the Piazza del Duomo, Piazza of the Duomo (cathedral), you may or may not be face to face with the Tower. I have entered this area from both ends. The first time, I came down a street and all of a sudden THERE IT WAS. It really is impressive. Very large and very white. I was in awe as I am sure you will be when you go. 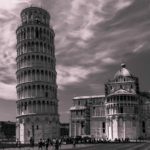 But there is more to the Piazza dei Miracoli than the tower. There are other buildings, I think, that are just as impressive. There is the Baptistery, the Cathedral, there are statues on the large expanse of grass that is the Piazza. This property covers several acres. They encourage you NOT to walk on the grass, and this is a good idea from a damage prospective, but to me, even more importantly it frames these great structures by not having people crowded all around them. And people there are a lot of. But they remain respectful for the most part and stay on the paths. 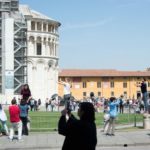 Speaking of people, you have seen the photos by taken by friends and others that have gone to the Leaning Tower of Pisa where they are simulating holding up the tower. When you go you have to at some point just step back from the crowd and watch these antics. It is so humorous when you see so many people doing this. I included photos of this, not in perceptive of what they are doing, not showing you how they are “holding up the tower”, but from a bystanders view point, watching them taking selfies or having others do the photo of them holding up the tower, it is very funny to watch. I am a photographer and a writer, and I love my photography, so I have included a couple artsy photos that I hope you will enjoy. From a photographers view point there are just so many shots to take when you are there. And again, NOT just of the tower. If you want to see more photos by me, email me at iwanttogotherephoto@yahoo.com and I will see what I can do for you. If you like Tuscany, I have a lot of great shots from this region. In another story I will tell you about The Amalfi Coast, Pompeii, and a small town called Spoleto where you will find La Rocca Albornoziana a fortress sitting high on hill. How they built that thing up there I will never know. It was hard enough getting up to see it without thinking about how they go the building materials up there. Ciao.